To reserve this property, please call (866) 690-2074 or email manager to receive the best pricing available for your requested dates of stay. 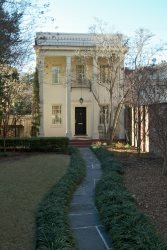 Historic hideaway with all of the comforts of home, this beautiful 3 BD, 2.5 bath is ready to welcome you to Savannah. Located just a block from one of Savannah’s famed squares, Crawford, you couldn't ask for a better part of town. You won’t need a vehicle as this property is easily walkable to anywhere you want to go in the Historic District. This picturesque brick home has three levels that are thoughtfully decorated. The first level includes the large living room, a gorgeous and a fully equipped kitchen. Sit down on one of the two large couches and chat or catch up on local news on the flat screen TV. There is also a powder room for your convenience. The second level includes two bedrooms, each with queen sized beds and a shared bathroom that can be accessed from the hallway. Each bedroom has a flat screen TV. The third level features the master bedroom with king bed and queen futon as well as a bathroom with jetted tub. Again, there is a flat screen TV. The large laundry room is also on this floor. Enjoy the private outdoor space with table and chairs. There is also one private off street parking space for your vehicle and free WiFi. Call in today to book this beautiful home for your next getaway. PETS: This is a pet friendly property. If you do book please let us know how many/what type pets you'll be traveling with so that they can be approved. This property will consider small dogs. There will be a pet fee added to your reservation. Thanks! Kim was so helpful & quick to answer the phone when we had a question about thermostats. Loved Savannah and our captivating savannah flat was perfect for our stay (Yearly college girls reunion)! The house was beautiful and in the perfect location. Highly recommend. From the very beginning everyone was very helpful and extremely friendly. It was a beautiful home, very clean, and beautifully decorated. We felt right at home. 402 McDonough exceeded our expectations for a long weekend to explore Savannah and celebrate our daughter-in-law's 30th birthday. Loved being located halfway between the Riverfront and Forsyth Park, which made for easy walking to everything we wanted to see, including the Jazz Festival and Saturday farmers market. The brick and iron courtyard gave us a great second social space to drink coffee in the morning and lounge after dark. We're going to recommend this place to all of our friends.